October | 2015 | Syed Jahanzaib Personal Blog to Share Knowledge ! 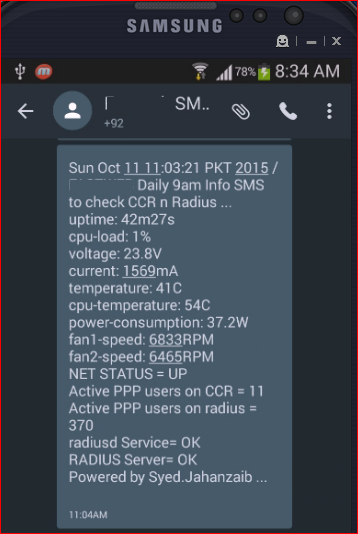 [For Reference] Quick Script for Mikrotik Daily Info via SMS or Email ! DUAL DSL wan links are connected with mikrotik [modems are in bridge mode], Configured as PCC along with the pppoe server. USB modem is attached with the Mikrotik via USB port. The OP need an script which can daily send sms or email specific information to admin cell, or whenever admin require on urgent basis via sending sms to mikrotik and it can return back the info to the admin cell. Following script will collect information from Mikrotik system such as active pppoe users, CPU load, dsl links status etc and send this information to admin via SMS or Email either via scheduler or as receiver command on mikrotik. [I am already using much more advance version of this script in other networks in linux system as BASH is the best ground to support scripting but since linux was not available at this spot, i had to use Mikrotik only with usb modem attached] it can be set as receive command too so that admin can send sms to mikrotik and mikrotik will reply back the current info to the admin mobile. 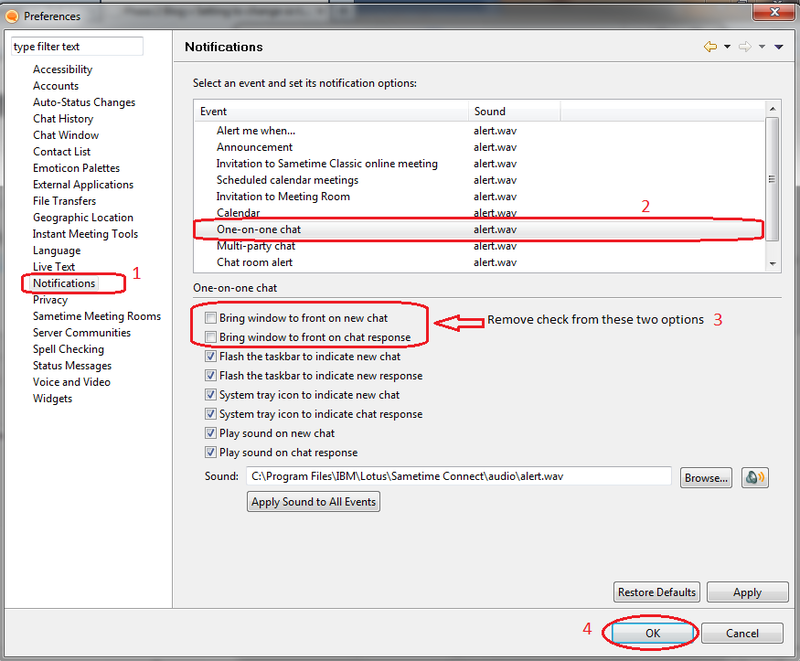 Sometimes its very useful for remote admins. :log warning "INFO: Daily info for NETWORK @ $date $time\nActive PPPOE Users = $PPP\nUptime is $UPTIME\nCPU Load = $CPU\nDSL1 = $DSL1\nDSL2 = $DSL2\nFTP = $FTP\n\nPowered by J." :log warning "Sending DAILY MORNING ALERT SMS on $cell1 ... by J." Use following command to enable SMS receiving on mikrotik. 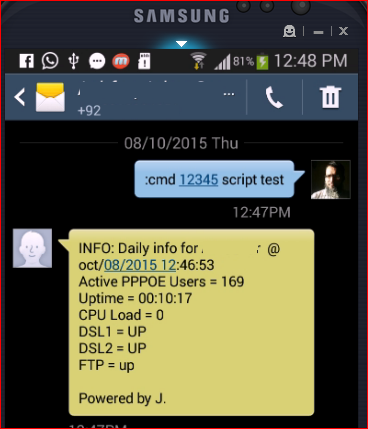 From your mobile you can send following message to run script on remote mikrotik. test is script name you want to run. Another mature version where we are using 2 mikrotik as NAS and freeradius as billing. echo -e "ALERT ..... MIKROTIK $MIKROTIK1 is DOWN"
echo -e "-Mikroik $MIKROTIK1 PING OK, Proceeding further ..."
echo -e "ALERT ..... MIKROTIK $MIKROTIK2 is DOWN"
echo -e "-Mikroik $MIKROTIK2 PING OK, Proceeding further ..."
echo "-$DB_RADIUS database exist OK. Proceeding further ..."
echo "-$DB_RADIUS database does not exist!" echo "-$MYSQL_SRV is down. Pleasec check your $RADIUS_SRV service first"
echo "-$MYSQL_SRV is accessible OK. Proceeding further ..."
echo "-$RADIUS_SRV is down. 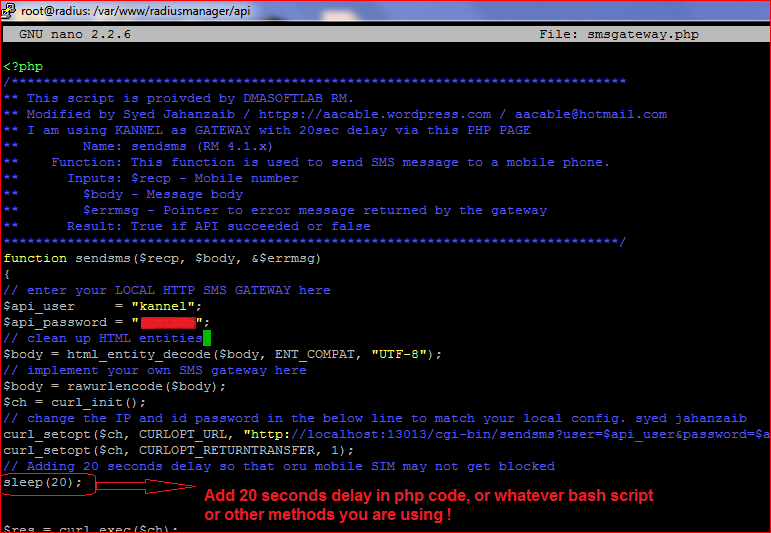 Pleasec check your $RADIUS_SRV service first"
echo "-$RADIUS_SRV is accessible OK. Proceeding further ..."
From ISP perspective, sending notifications for different events like expiry alerts, quota warning alerts, service disruption alert, welcome messages, password recovery via sms, etc etc to users is generally a good idea and becoming essential part of services. To send SMS in a proper way, its recommended get 3rd party SMS gateway services so that SMS goes by your company name and there should be no legal issue. but for smaller networks with lesser number of users, hiring 3rd party services is not financially suitable. SIM gets blocked If you cross 200 SMS limit in 15 minutes and some mobile operator blocks SIM if you send 500 sms in 1 hour. If you are using KANNEL, and sending SMS using BASH scripts, add delay by using “sleep 20” (20 seconds delay) in the loop section so that there should be at least 10 or 20 seconds delay in between each sms sending. After adding 20 seconds delay to the code, only 3 SMS will go out per minute. You can adjust and fine tune this delay as per your requirements. In KANNEL there is an option ‘throughput‘ via which per sms sending can be controlled but for somehow it didn’t worked for ever. 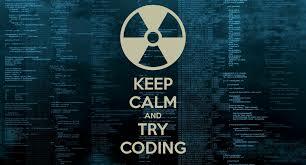 Therefore I used delay codes in the scripts or at the processing of submitting code. 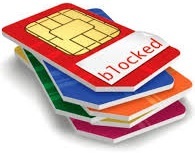 Also share your experiences on how your SIM got blocked, what are other operators SMS sending limits? PTA limits etc.